Allyn Cox Oil on Canvas 1973-1974 The 1866 civil rights bill, which prohibited discrimination on the bases of race or previous condition of slavery, prefigured the 14th amendment to the Constitution. 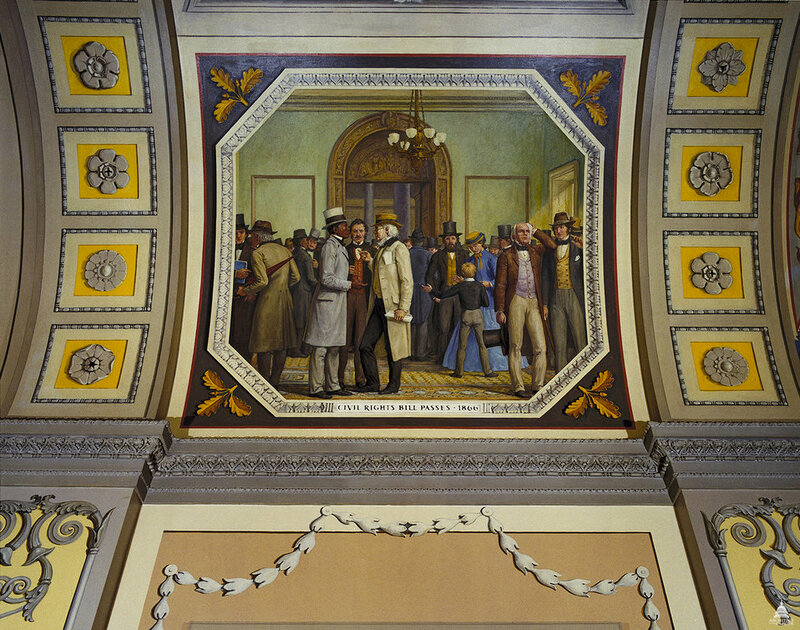 In the foreground of the mural, former slave Henry Garnet is shown speaking with newspaper editor Horace Greeley, who supported African American suffrage. In the background are the Columbus doors, which originally led to the House Chamber but were later moved to the Rotunda entrance. This official Architect of the Capitol photograph is being made available for educational, scholarly, news or personal purposes (not advertising or any other commercial use). When any of these images is used the photographic credit line should read âArchitect of the Capitol.â These images may not be used in any way that would imply endorsement by the Architect of the Capitol or the United States Congress of a product, service or point of view. For more information visit www.aoc.gov.